Owners very keen to Sell. Just returned to the Lake (Dec 2015) with the following completed:- Reclad & full external paint; Pontoons sanded & painted; Motor & Leg serviced; GWTS installed; Upstairs interior repainted. 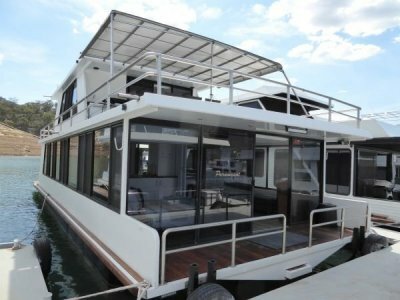 You would be purchasing this excellent houseboat holiday home with all the big ticket maintenance items all recently completed. 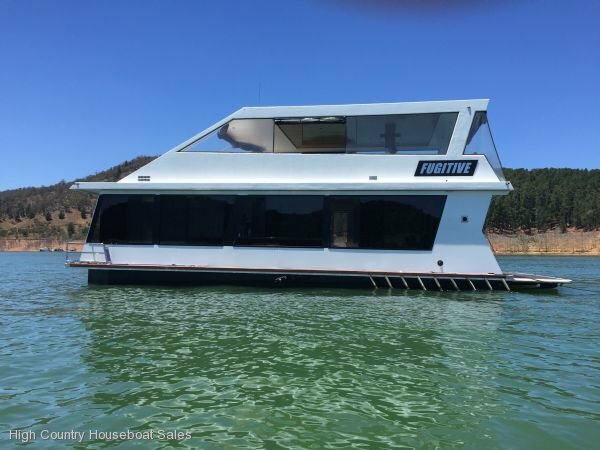 Escape with the family to a secluded inlet amongst the Mountains and Forests of magical Lake Eildon on a magnificent holiday home on the water. Fugitive allows your family to do this in style and comfort. Fugitive is a extremely well appointed holiday home with quality appliances, furniture and equipment. The high ceilings invite the magic into the holiday home. Then there is the great upstairs all year round relaxation / entertainment area under the hardtop. Imagine sitting back relaxing on the rear couches and taking it all in. Fugitive is great for a family with three bedrooms; ducted reverse cycle air-conditioning throughout plus the Satellite Auto Tracker, so you will not miss the Cricket, Tennis or Football. Then there are the hidden expensive items:- High end electrics with two Outback Inverters, good deep cycle batteries, 10 solar panels and backed up by a large economical Onan diesel generator. Then there is the Bow Thruster; the Garmin GPS; Hummingbird Fish Finder & Reversing Camera. 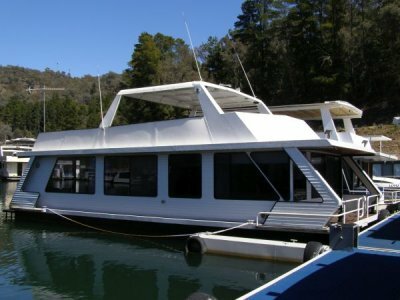 Fugitive was built in 2008 and has been extremely well maintained ever since. Fugitive is a quality holiday home, priced to sell; Don't miss this great opportunity. Walk on board with the family and head for those secluded inlets amongst the mountains and forests. BR1: Double walkaround front view bed; Overhead cupboards; Under bed storage; Air-conditioner vent; Bathroom access. BR2: 2 x single beds bunk; Under bed storage; Air-conditioner vent. BR3: Single over double bed bunk; Under bed storage; Air-conditioner vent; Cupboard, main fuse boxes & battery monitor. Bathroom: Twin vanities; Shower; Toilet. Kitchen: Pantry; Electrolux electric fridge / freezer; Westinghouse wall oven, grill; Miele 5 burner bench cooktop; Miele rangehood; Miele microwave oven; Miele dishwasher; Servery; Bar fridge electric; Onan Gen Set Remote Start; Outback System Monitor. Kitchenette, sink, Highland grill plate gas; Rangehood; Rear cane & cushions 3 seater couch & footstool. 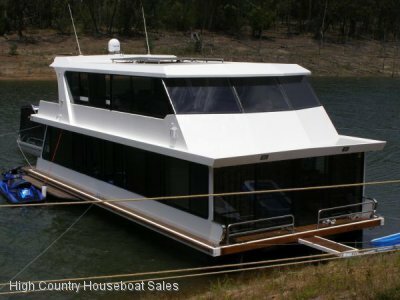 POWER: Onan 11kva Marine Diesel Gen Set; Outback Inverters x 2; Outback Flexmac 80amp Solar Controller; Deep cycle 200amphr sealed house batteries x 8; Solar panels x 10; Mercruiser V8 5.0lt MPI; Motor start battery. Dec 2015 Reclad & full external paint; Pontoons sanded & painted; Motor & Leg serviced; GWTS installed; Upstairs interior repaint.